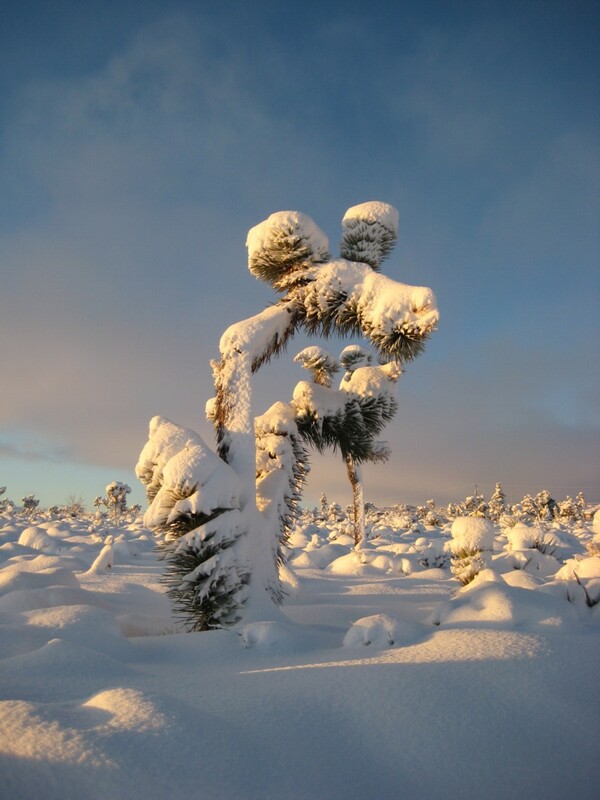 “It was like dying, this watching the world recede into deeper and deeper blues while the snow piled; silence swelled and extended, distance dissolved, and soon only concentration at the largest shadows let me make out the movement of falling snow, and that too failed.” – Annie Dillard. 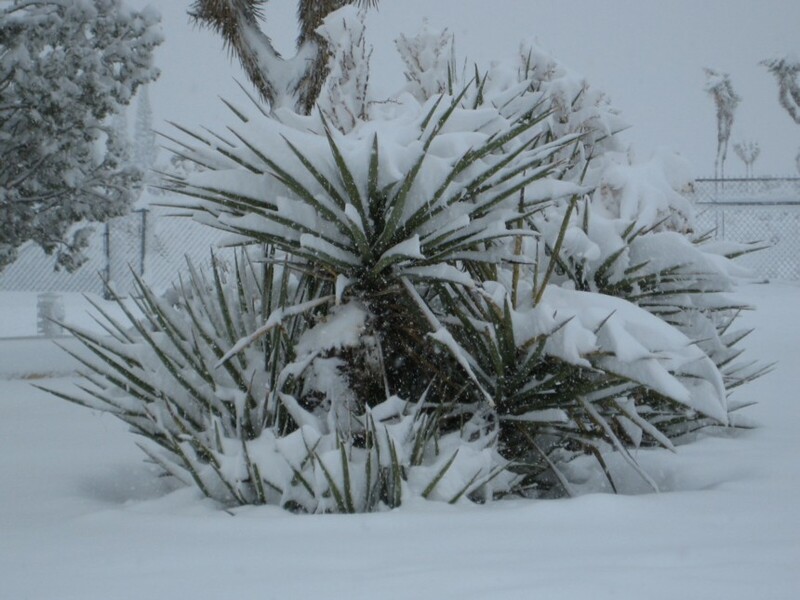 The most unusual thing happened last week – it snowed in Yucca Valley. 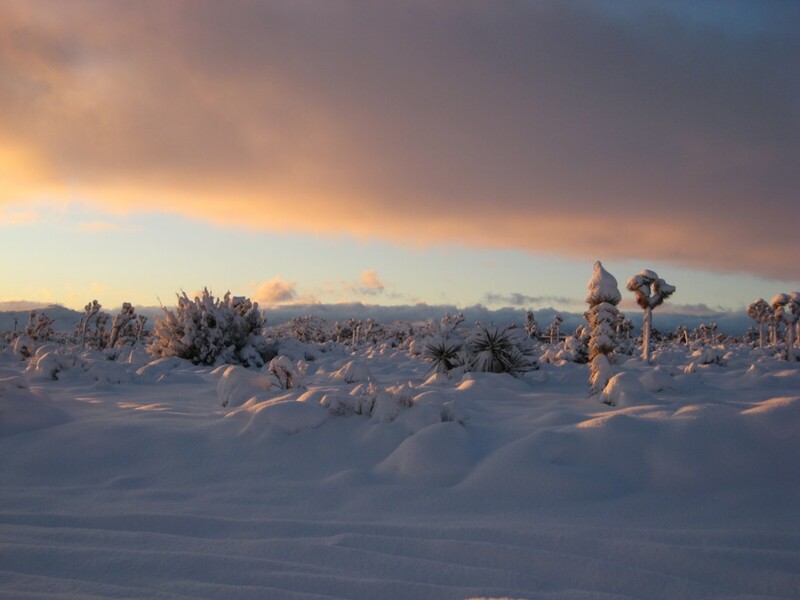 Betraying its own feathery lightness, the mounting snow weighted down the branches of the mesquite tree that stands outside my window and, at one point, I began to worry that my flat “made for the desert” roof might cave in. But nothing of the sort happened. The only travesties were a leaky roof and a broken electrical wire that connected me to the outside world. Other than that, I was simply stranded at home. In my fantasies, I would welcome such an occasion. My biggest complaints are that I never get enough solitude and that I am always expected to be “somewhere” other than where I currently am. Over the last year, due to family and work responsibilities, it has felt that my life was reduced to the meaning expressed by my car’s odometer. So, what is a better excuse to stay put than to be stuck in snow? Oddly, I found myself feeling trapped, not by the snow, but by my own mind. As soon as I realized that I was really house bound, thoughts began to swing about recklessly from one branch to the next. It was as if, by having to be still, a horde of miniature monkeys were set free within the walls of my head. In the meantime, the snow continued to softly fall outside my window. I noticed the quail taking shelter under the mesquite. 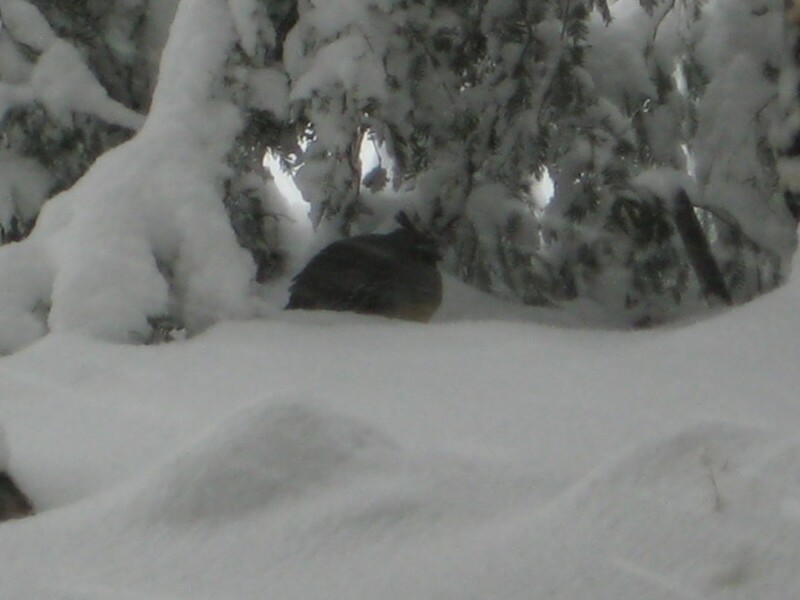 Hungry, no doubt, but looking quite protected in the cavern of the snow covered branches. While my car disappeared under the snow, the footprints of the quail made an impression. I stepped outside and gathered a few more pieces of wood for the fire. The fire burned furiously. I decided to sew. “Loneliness invites the unconscious”, write Marie-Louise von Franz. There is a death-like quality about the snow. Its cold white carpet descends upon us, silencing us and awakening the demons inside. Nobody can avoid nature. We all vanish under the white cold carpet. Our footprints make but a brief impression. By the next morning, after the storm fled, I encountered not a chilling loneliness, but rather a crystalline miracle; a mixture of excitement and serenity. Today, I can’t go anywhere. My roof is leaking and the world is rushing in. This entry was posted in Deserts. Bookmark the permalink.